Going into the final day of the 2013 Dragon Edinburgh Cup supported by Aberdeen Asset Management in Weymouth an exciting sixth and final race with six boats all still in with a shout of victory was anticipated, but little did we know that ultimately the day would exceed everyone's expectations for drama, excitement and surprises. Weymouth was at its best with sunshine and a decent north-westerly breeze which built from 8 to around 16 knots through the race. You could feel the tension in the air as the boats came to the line and the tacticians made their crucial decisions about where to start and how to attack the first beat. The leading group of Poul Richard Hoj-Jensen (20 points), Klaus Diederichs (21 points), Gavia Wilkinson-Cox (22 points), Lawrie Smith (24 points), Grant Gordon (31 points) and Julia Bailey (32 points) spread themselves across the line with Bailey and Smith furthest left and Wilkinson-Cox furthest right. 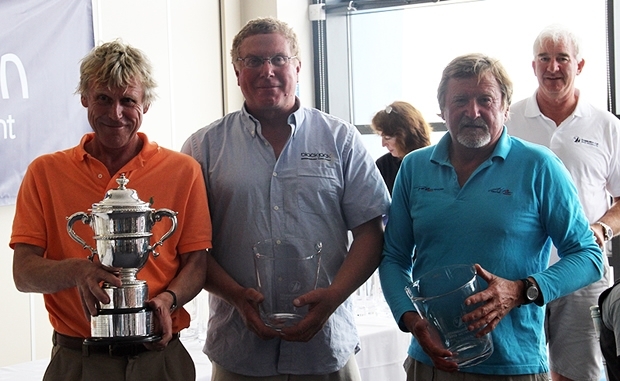 As they came round mark one Mark Dicker sailing with James Cameron and Drummond Sydenham headed the fleet, Ron James sailing with Julia Walsh and Mark Pettitt was second and Ted Sawyer sailing with Martin Payne and Pedro Arriaga was third. Behind them Bailey slotted into fifth with Gordon sixth and Wilkinson-Cox seventh. Smith was just behind in ninth but there was then a huge gap back to Diederichs who rounded in the mid 20s and Hoj-Jensen down in the 30s. So all Wilkinson-Cox had to do was hold her position and she had it in the bag... Which is very much easier said than done in a Dragon fleet of this standard. By the second weather mark Wilkinson-Cox had dropped back to eleventh but Smith was up to third and Gordon was sixth as Diederichs continued to languish down in the mid 20s and Hoj-Jensen in the 30s. Smith now had the overall lead and it appeared to be between Gordon and Wilkinson-Cox for second and third with Diederichs and Hoj-Jensen potentially out of the running. But with another run and beat still to sail there was plenty of room for losses and gains and places were changing every few seconds. As they came to the line everyone was on the edge of their seats and frantically counting off boats and adding up points. Dicker led the fleet over followed by Mike Hayles, sailing with Monique Hayles and Julian Brooke-Houghton, and then Gordon crossed in third with Smith fifth. Bailey finished in eleventh to claim the Corinthian Trophy, but she was out of the running overall. On the final beat Wilkinson-Cox tried a left flyer in a desperate bid to claw back ground but it didn't pay and she finished fourteenth, her worst result of the regatta. Diederichs on the other hand seemed to find the overdrive button and roared up the final beat going from 21st at the last gate all the way up to twelfth on the line. After some 90 minutes of cutthroat racing and a lot of frantic points calculations it was confirmed that Lawrie Smith, sailing with Ossie Stewart and Tim Tavinor, had secured victory with 29 points and Klaus Diederichs, sailing with Andy Beadsworth and Jamie Lea, was second on 33 points. However, Grant Gordon sailing with Ruaridh Scott and Joost Houweling, Gavia Wilkinson-Cox sailing with Jean Sebastien Ponce and Vicente Pinheiro de Melo and Poul Richard Hoj-Jensen sailing with Andrew Norden and Hamish McKay were all tied for third place on 34 points and could only be separated on count back. It wasn't until the boats got back ashore that confirmation finally came that Gordon had claimed the third place on the podium with Wilkinson-Cox fourth and Hoj-Jensen fifth. In the Corinthian Division victory went to Julia Bailey sailing with Graham Bailey, Keith Tippell and Will Heritage, Simon Brien sailing with Mark Brien and David Gomes finished in second place overall and Julian Sowry, sailing with Claire Sowry and Neil O'Hagan was third. At the prize giving, which featured traditional British afternoon tea and cakes, a very happy Lawrie Smith thanked the organisers, his fellow competitors, the sponsors and particularly the excellent race committee for a great regatta. He also paid tribute to his crew Ossie Stewart and Tim Tavinor and acknowledged, in his own wry way, just how delighted they were to win the prestigious Edinburgh Cup saying, "As we crossed the finish line Tavs said to me 'Thank [goodness] for that - I've been trying to win the [darned] thing for 30 years.'". Also adding, "I am very very pleased to win the Edinburgh Cup, as you know its a very famous trophy and I used to read about it and now I've won it!" The Dragon has always been a family friendly and equal opportunity class and it was wonderful to see no less than thirteen of the 41 competing teams included family crews with four lady helms and fourteen teams sailing with female crew members. It was also very encouraging to see that not only are the number of participants in the Edinburgh Cup going from strength to strength, but that the class is also attracting a lot of younger crews keen to enjoy the technical intricacies and competitive challenge of what is arguably the most historic and successful one design class in the World. The International Dragon fleet will be back in Weymouth from 5-13 September 2013 for the Gazprom International Dragon World Championship.